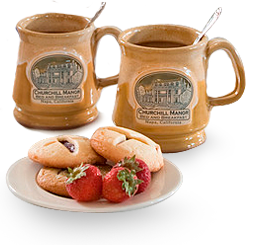 Start your day with a great breakfast at Churchill Manor, a Napa Valley lodging. Come down at your leisure any time between 8:30 a.m. and 10:00 a.m. Choose to dine inside in the vineyard frescoed sunroom or outdoors on the expansive veranda that wraps around three sides of the mansion overlooking the rose gardens of our Napa Valley accommodation. 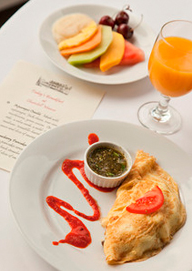 Our three course breakfast stands out among other bed and breakfasts in Napa, California. It begins with a buffet of freshly baked sweet and savory bread offerings, gourmet coffee and teas, freshly squeezed orange juice, granola, and yoghurts. Once seated, our innkeeper will serve your fresh fruit course of the day, and present the day’s menu with two hot entrée choices, one sweet and one savory. Entrée specialties include omelets, pancakes, huevos rancheros, French toast, crustless quiche, polenta with Canadian bacon, poached eggs, and so much more. We shall ensure that all your expectations of an exceptional Napa Valley accommodation will be fulfilled here at Churchill Manor. For multiple-night stays, you will enjoy the variety we offer with our daily-changing fruit course and two daily-changing hot entrées. For those who want a more standard breakfast fare, we always feature the morning buffet of granola, yoghurt, and fresh orange juice. The morning newspapers are at your disposal to help you ease into the day. If you feel sociable, there’s always plenty of conversation to be had. If you prefer a little more privacy, the veranda offers plenty of intimate seating areas. For checking your emails, there is complimentary Wifi available throughout the mansion and on the veranda. In the afternoon, enjoy our freshly-baked cookies and refreshments. Learn more about our amenities and services on our Napa Valley lodging rooms and rates page. 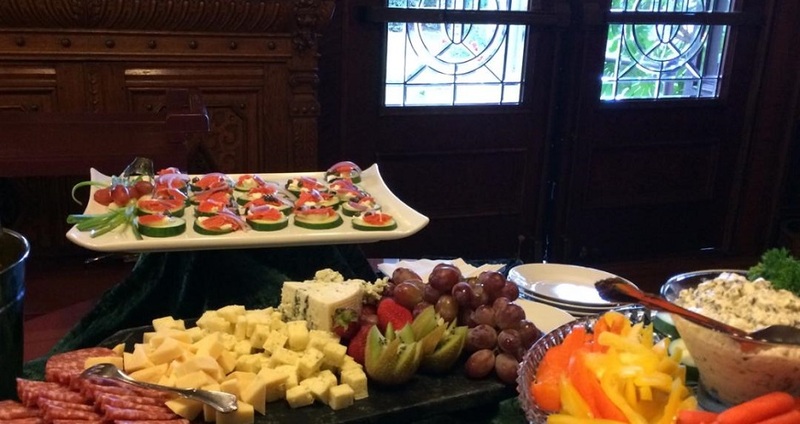 For two hours each evening, we present Napa Valley and other specialty wines along with appetizers including domestic and imported cheeses, toast points and crackers, seasonal fruits and vegetables, assorted tapenades, and dipping sauces. Feel free to socialize with other guests, play a game of croquet in the side garden, or just unwind on the expansive veranda. At our Napa Valley lodging, we offer variety and flexibility to suit your individuality. Enjoy a couple of our favorite recipes in your own kitchen.